Capture four DVI-I High Definition DVI streams in a single capture card. The VisionHD4 is an eight lane PCI Express capture card with four independent video capture channels, supporting HD capture. This video capture card provides a high performance high density video capture solution for control room, medical and other applications that require high capture bandwidth. The quad HD capture capability in combination with Datapath's multi stream and synchronisation features enables resolutions up to 4096x2048 and Quad HD solutions. The VisionHD4 captures all four HD video channels simultaneously and triple buffers them into onboard storage for tear free video, alongside embedded HDMI audio streams can also be captured from each channel. 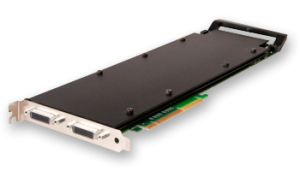 This full length video capture card has four capture processors, each providing 800 MB/s bandwidth. HD Modes 1080p, 1080i, 720p, 576p, 480p and 480i suing a Component-DVI connector. Update Rate User defined, capture frame rate will match the source providing max data rate (800MB/s) is not exceeded. * Adapters for other types of video connectors such as DVI/HDMI, DVI/VGA or DVI/Component are not included with the VisionHD4 but are available from Datapath, contact our sales team for details.